The discussion on what gold is good for appears to take a new sharp corner with every day. Only one day after German financial watchdog BaFin said gold is not money, without providing any hard facts to back up its dumb opinion, it is of all places the Wall Street Journal (WSJ) that fired a fact and data based broadside the other way a day later. WSJ writer Jeff Opdyke simply did what needs to be done before forming an opinion and checked correlations between the global currency of the past 2,800 years, commodities and fiat money. Opdyke has correctly noted that gold does well in both periods of inflation and deflation times. As gold is routinely called a hedge against inflation, it is interesting to see that it stubbornly remains close to its all time high at $1,258 reached on June 18 despite continuously low (official) inflation figures and frequent deflation warnings from the Federal Reserve. Remember, President Roosevelt jacked up the gold price from $20 to $35 per ounce in the worst period of deflation the USA has ever seen. Both periods had one common denominator, though: The economy sucked, driving investors out of volatile (sinking) markets and into assets that are a store of value. Gold has never lost its value as all fiat currencies did so far. That is low. Really low. Perfect correlation is plus 1; at minus 1 two assets move in perfect opposition. Near 0 implies gold and inflation barely acknowledge one another, and moves in unison are largely happenstance. Going back to 1973—a period that defines the modern, non-gold-backed dollar—the greenback's movements closely track gold's direction. The correlation between month-end gold prices and the Major Currencies Dollar Index, as reported by the Federal Reserve, is minus 0.45. That clearly is a stronger correlation than you find with inflation. But let's take this a bit further. Let's shorten the time frame to the period from gold's 1980 peak to today. The result: Over the past 30 years, the correlation between the dollar and gold is minus 0.65—a high negative correlation. It means the dollar and gold are effectively on opposite ends of a seesaw. When the dollar is in favor, gold retreats. When it is under pressure, gold prices swell. The chart to the right proves this and shows at the same time that we are entering a storm area. Until 2005 gold inversely mirrored all strengths and weaknesses of the USD index before it began to outpace the dollar's performance by far in the last 5 years. I am not surprised as it were the growing difficulties of a disintegrating US economy that motivated me to begin writing this blog in 2005. While I have the liberty to enunciate my perception of gold as money without having to ask a math genius whether 2+2=4, Opdyke quotes QB Asset Management expert Paul Brodsky. "Gold is a currency" whose daily price is a gauge of the market's concern about the "potential diminishment" of the purchasing power of the dollar and other paper currencies, he said in the WSJ. Deleting all the ifs Opdyke uses in his post I am delighted to see that Wall Streeters wake up to the virtues of gold. I fully agree that it is the potential longer-term weakening of the dollar that is the real issue for the gold market, not inflation or deflation. The question, with gold hanging around the $1,200 level, isn't "Is gold in a bubble?" as so many are asking. It's "What next for the dollar?" 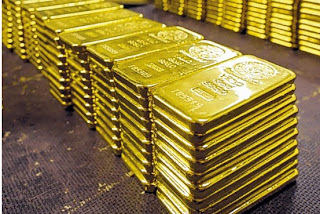 It is great to see that the still most influential financial newspaper in the world has abandoned it's frothy style of gold bashing I have once criticised in this post WSJ Misses 7-Year Bull in Gold, Now Warns of Risks in Manipulative Report, that was fun to write and is still entertaining when reading it. Seeing a wider array of gold opinion arriving in what was once the Federal Reserve's bulwark against the goldbugs I have only one last request. Could the WSJ please do some data research on true inflation. My annual online subscription has doubled in price over the last 2 years. This does certainly not conform with official consumer price date from the Bureau of Labor Statistics.